Ever wanted to Save a Webpage as a PDF File? Well, it’s pretty easy. There’s a new website known as PDFmyurl.com. It allows you to convert any website into a PDF file and save it to your computer. PDF files are great for storing and reading. Saving a webpage as a PDF File is ideal for viewing the page offline. 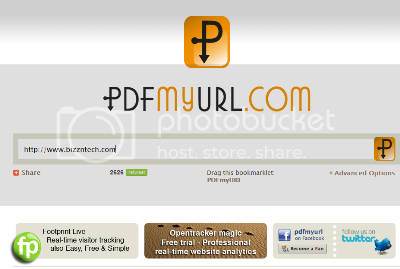 PDFmyurl has an extremely user friendly interface. TO save a webpage as a PDF File, all you need to do is simply go to PDFmyurl.com and enter the link of the webpage in the box and hit enter. You don’t need to worry about formatting and stuff. It does the job by itself.